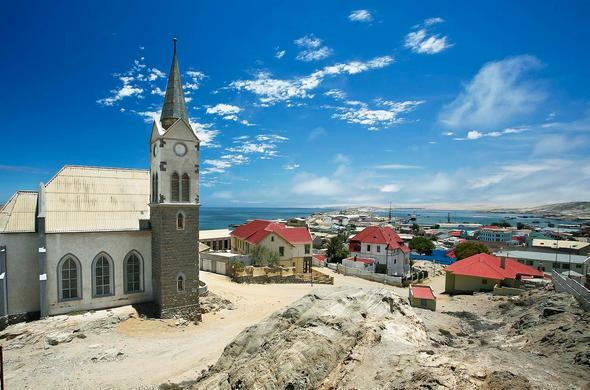 Luderitz is a quaint harbour town on the Atlantic Coast in Namibia. It boasts German history, art-deco architecture and excursions to the ghost town of Kolmanskop. Luderitz in southern Namibia is isolated on a wild and windy shore - it is surrounded by the Namib Desert and has only one road in, yet, the harbour town of Luderitz has a quiet charm under cobalt blue skies. All visitors to this coastal town in Namibia are encouraged to walk around and have a look at the colonial buildings and brightly coloured German Art Deco style architecture, which is so at odds with the extremely rocky Atlantic coastline of southern Namibia. There are a number of restaurants in Luderitz, Namibia, where you can enjoy the bounty of the sea with lip smacking feasts on rock lobster, mussels and even oysters. Out and about you can enjoy wonderful walks on Agate Beach just north of Luderitz, take a drive to the Peninsula or go on a nice harbour cruise in Luderitz, Namibia. The waters of the Atlantic Ocean in Namibia are cold and clean which encourages rich marine and birdlife. Highlights include the Felsenkirche, Goerke Huis (House) and Luderitz Museum which gives information on diamond mining, indigenous peoples, life in the Namib Desert and facts on fishing and marine life. Or go on a Harbour Cruise in Luderitz, a popular excursion from Luderitz is an early morning trip to Halifax Island and the Jackass Penguin colony. Fur seals and dolphins often swim alongside the boat and the cold, but exhilarating morning air is invigorating in good weather. Agate Beach is a few minutes north of Luderitz, Namibia, and a wonderful place for walks and digging for treasure. If you'd like to take home your very own, totally unique Desert Rose, then you would first need to obtain an inexpensive digging permit and the services of a guide from the Nature Conservation Office. Together, you can explore the beach and find a sand rose which is made from crystallised gypsum. For a scenic drive in Luderitz you can go around the lagoon which is busy with lots of birdlife including pink flamingos, towards the Peninsula. En route you pass picturesque bays and unspoilt beaches in a protected area. At Diaz Point you will be on the spot where Bartolomew Diaz first landed in Southern Africa. Even further you can see Bogenfels which is a famous rock arch. Visit the ghost town of Kolmanskop and the Forbidden Zone (Sperrgebiet) near Luderitz, The Sperrgebiet (an off-limits diamond region in Namibia) occupies a large area of the southern Namib Desert. It is larger than Wales and situated right next to Luderitz. An old settlement within it is Kolmanskop, a remarkable town that sprang to life in 1908 when diamonds were discovered in this barren and sandy place in Namibia. An astonishing amount of stones were extracted from Kolmanskop and nearby Elizabeth Bay. Fortune seekers descended and within 2 years Kolmanskop was a booming town complete with elegant homesteads, a hospital, butchery, bakery and factories for making furniture, ice, soda water and lemonade. There was a lively '20s culture in town with a casino, skittle alley and even a swimming pool! This golden period only lasted 40 years as the amount of gems found became less and less and eventually, better diamond deposits were discovered in Oranjemund further south. Kolmanskop was abandoned and left to succumb to the ever shifting desert sands and wind. Kolmanskop is now a crumbling ruin and a fascinating place to visit. Permits are obtained in Luderitz after which you can join a daily tour to this ghost town. Off road adventures near Luderitz in Namibia can be arranged with advance notice, which explore deeper in the Forbidden Zone where picking up diamonds by the handful was once a reality. You could also visit an operational diamond mine, although these excursions require proof that you are not a criminal! You can enter the Forbidden Zone (Sperrgebiet) in Namibia which is an off limits diamond area. You can take a tour to the famous ghost town of Kolmanskop and also go off-road on guided 4x4 adventures. Another option is travelling inland on the road to Keetmanshoop where you can see dramatic scenery on the way to Aus in Namibia, home of wild desert-adapted horses.